NYAPRS Note: Join our presenters as they share how the Hearing Voices Network (HVN) started and now flourishes as a world-wide movement. HVN is an innovative approach offering self-led support for individuals who hear voices and have other unusual or extreme sensory perceptions, such as seeing visions. Hearing Voices challenges the stigma around such experiences by offering a supportive environment free from judgment or the assumption of illness. Our presenters travel the world educating professionals on how they can use hearing voices methods in their work with people and their families to promote recovery and community inclusion. Then hear how this innovative approach has been implemented in two of our NYS program models, a PROS program at the Southern Tier Integrated Recovery Services, Family Services of Chemung County and the Sterling Community Center at the Mental Health Association in Westchester County. The MRLC is a special Members only benefit. If you are not a member and would like to learn more about the MRLC and other member-only benefits, please contact mary at nyaprs.org. Come join us. We are pleased to be able to offer our members the most up to date information on new ideas and healthcare reform. Join Us! Presenters: Ron Coleman is a voice hearer. He spent 10 years in services mainly as an inpatient before deciding to recover. Ron was the first national coordinator of the UK hearing voices network and is a respected trainer, consultant and author travelling the world and teaching with his wife, Karen Taylor, a registered mental health nurse. For the past 16 years Karen and Ron have worked together supporting recovery training and practice and co-authoring the Working to Recovery Workbook. Jeremy Reuling has more than a decade of experience working to support and empower people diagnosed with mental health conditions. An advocate of peer-informed services, Jeremy approaches his work from a peer-professional viewpoint. He is the Director of MHA of Westchester Sterling Community Center and presents regularly at conferences and training events throughout New York State. Jeremy received his MSW from the Hunter College School of Social Work and is licensed as a Clinical Social Worker in New York. Kathy Brink has worked at Family Services of Chemung County, Inc. for 12 years and is the Assistant Director within the Southern Tier Integrated Recovery Services program which is a New York State PROS program resulting in positive outcomes both in participants' decrease in symptoms as well as increased supports that they have been able to establish with their peers. 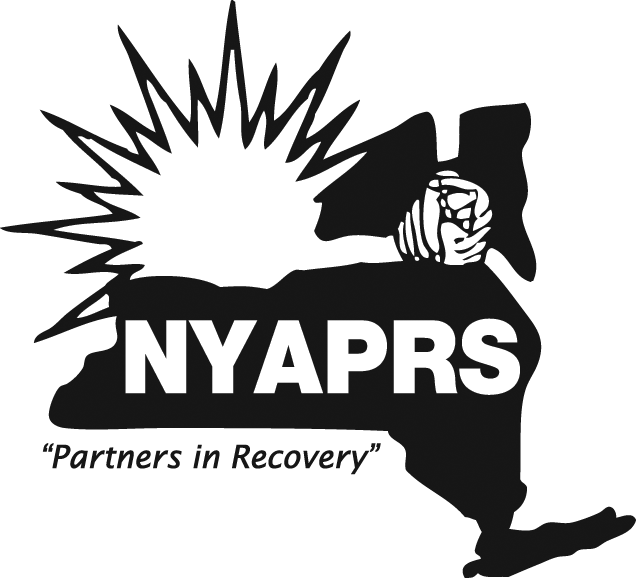 For more information about this event or to join NYAPRS as an organizational member, visit our website at www.nyaprs.org<http://www.nyaprs.org> or call our office at 518.436.0008! You are receiving this email because you are member of NYAPRS enews list. If you wish to unsubscribe, please send an email to mary at nyaprs.org.